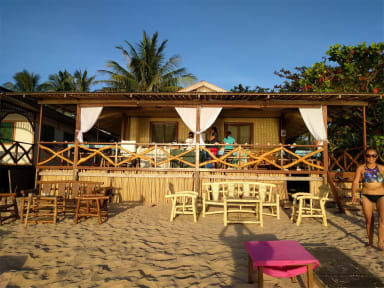 We are organize also tranaportation from Puero princesa to dandal bay view and we arrange island hopping tour like Tour A,B,C and D.
We have beachfront rooms with fan or aircon. The rooms are perfect for 1,2,3 or 4 people and have private badrooms. We ask 1200P for the room (for 2 person). If you wanne came with 3 or 4 we charge 600P a person. If you don t like dorms and looking for a good, clean, cheap and private room, then Dandal bay view is the place to be!! We are living on twin beach (next to Nacpan beach). Our beach is SO beautiful (see pictures) and is only 3 min walk from Nacpan beach. We have 24 hour electric, good WIFI, our own restaurant (local and western food) and alway's ice cold beer. We have motorbikes for rent and we sell boattrips/island hopping so you can see the most beautiful places/beaches in the world,we are arrange also transportation.from puerto princesa to dandal bay view and el nido to dandal bay view.